Over the weekend, we heard about this cool project from Khanjan Mehta ’83g, director of Penn State’s Humanitarian Engineering and Social Entrepreneurship program. You might remember Mehta’s piece, called “Why Ideas Fail,” from the Jan./Feb. 2014 issue—or perhaps you caught his Huddle with the Faculty talk on social entreprenuership this past Saturday. 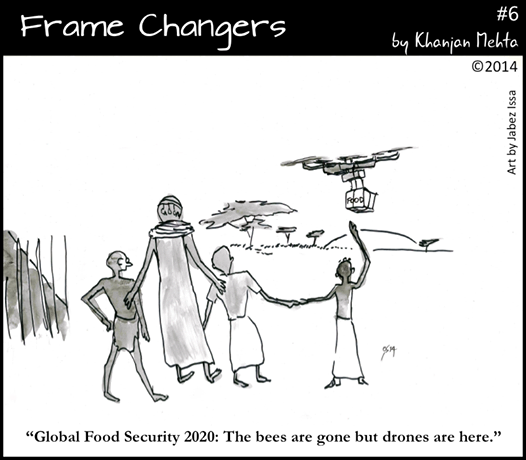 In his latest project, a cartoon series called “Frame Changers,” Mehta offers a new take on those same concepts: namely, how smart, sustainable technology can improve lives for people in developing countries. To see more, check out Khanjan Mehta’s website, or visit the Frame Changers Facebook page. Entry filed under: The Penn Stater Magazine. Tags: Frame Changers, Khanjan Mehta.